This is the best chicken soup recipe I have found. The trick is to skim for the first hour, let it simmer very, very slowly on the lowest heat – I use a flame tamer as well. You just want to see a couple of bubbles break the surface. In a kettle combine the chicken with enough cold water to cover it by 3 inches ( at least 15 cups) Bring the water just to the boil, skimming the froth and add carrots, turnips, parsnips, onions, celery and cheesecloth bag. Reduce heat to the point that the mixture cooks at a slow simmer and simmer the mixture, uncovered, for the first hour, skimming the froth. Then, cover the soup, but check it frequently to make sure that it is NOT boiling, for a total of 21 hours. BOILING THE SOUP WILL CAUSE THE FAT TO EMUSLIFY AND THE STOCK WILL BECOME CLOUDY. After 21 hours, simmer the soup for 3 hours more, uncovered. Crumble the bouillon cubes into the stock to taste, stir the soup until the bouillon cubes are dissolved, and add salt to taste. Strain the stock through a sieve lined with dampened cheesecloth into a large bowl and let it cool until it is just warm.. Chill the soup and remove the fat the next day. The soup may be frozen. I generally use the matzoh ball recipe from the back of the box! 1. With a table fork, beat the eggs until well blended. 2. Stir in the seltzer, the schmaltz and the salt and pepper. 3. Gradually stir in the matzoh meal. Cover and refrigerate for at least 1 hour, or preferably longer. 4. Bring a large quantity of water to a gentle boil in a very wide and deep pot with a cover; one with enough surface so that when the balls expand and float to the top, there will be only one layer of balls — and not crowded at that. I use an old-fashioned covered roaster placed over two burners. 5. Using about 2 tablespoons of the chilled batter for each matzoh ball, and keeping your hands moist with cold water (for convenience, I keep a bowl of cold water next to me as I work), gingerly roll the batter between the palms of your hands into neat balls. As you form the balls, drop them into the boiling water. 6. When all the balls are in the pot, cover the pot, adjust the heat so the water simmers briskly, and cook the matzoh balls for 30 minutes. They will double in size and float to the top. 7. 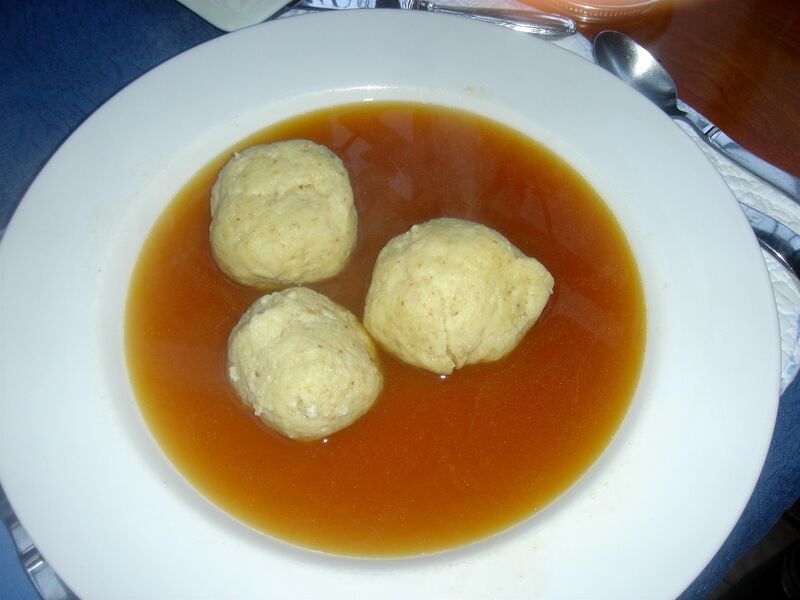 Remove the matzoh balls from the water with a slotted spoon and serve in hot chicken soup. Copyright © 1998 StarChefs All rights reserved.